On May 14th 1943, Australian Hospital Ship (AHS) Centaur was steaming a course 24 miles E.N.E. off Point Lookout, Stradbroke Island, on its way to New Guinea give aid to injured service personnel. At 0415 hrs it was struck by a torpedo fired from a Japanese submarine and sank within minutes of the attack, with heavy loss of life. Of Centaur’s compliment of 332, only 30 of the crew and 34 army medical staff survived. Among the survivors was just one of the serving nurses, Sister Ellen Savage. When attacked, AHS Centaur was unarmed and clearly marked with the Red Cross insignia in accordance with the Geneva Convention. Her existence had been communicated to Japan on the 5th June. The Prime Minister of Australia at the time could see no reason that Japan would not be aware of her. Centaur holds a special place in Australia’s war history because the war never came as close to Brisbane as it did on the 14th May 1943 when Centaur was attacked. Centaur was found off the south-east Queensland coast on 20 December 2009, solving a 66-year-old mystery about its final resting place. A search team aboard the search boat Seahorse Spirit found the wreck, about 30 nautical miles off the southern tip of Moreton Island, off the south-east Queensland coast. It was found in one piece just seven days into the official search and close to a position calculated by the hospital ship’s navigator, Gordon Rippon, who radioed the position as the ship was sinking. An exclusion zone has been set up around the wreck and a memorial plaque placed on the wreck to remember the 268 people who perished, including 11 nurses. This poster was designed to epitomise the public feeling of outrage at this wartime atrocity. New Guinea. 15 September 1944. 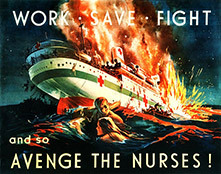 A Victory War Loan poster, reading “Save for the brave Let us avenge the Nurses”, which had been displayed in one of the workshops at Lae. The poster depicts AHS Centaur which was sunk on 14 May 1943 off Point Lookout, Qld. 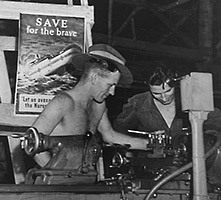 Corporal E. Johnston of Camberwell, Vic (wearing hat) and Staff Sergeant S. Steward of Fitzroy, Vic, are working at the lathe. Special permission was granted by the Australian government for the search team to attach to the commemorative plaque, a CD produced by The Centaur Association, which contains the names of everyone who served on the ship along with personal notes from family. The location where the plaque was laid – just starboard of the forward (No. 1) hatch opening–was chosen because it was deemed to be the most visible and permanent. Special care was taken to ensure that the 29lb bronze plaque would not damage the wreck in any appreciable manner. Approval for the plaque to be laid directly on the wreck was granted by the Department of the Environment, Water, Heritage and the Arts in the form of a permit under the Historic Shipwrecks Act 1976. 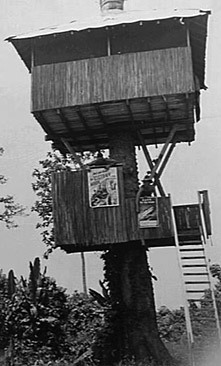 Displayed in a Lae, New Guinea.